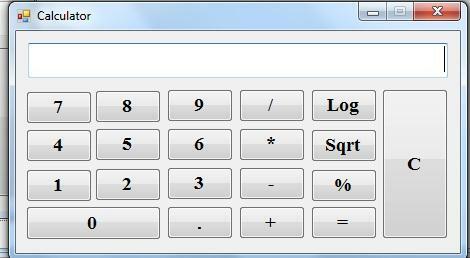 How to Make a Calculator in VB.Net with Mathematical Functions. This calculator can make all the normal functions of a calculator as wel as some Mathematical functions like Square root, Log,Percentage etc. In the previous article I show you an example of navigation of records in MYSQL database table in VB.Net. In this article I am going to show you how you can make a simple calculator in VB.Net with some mathematical functions. First create two variables f and res as shown under. Then you need to write the code on each of the buttons click procedure on the VB.Net form. There is also a function called Keys which is used to prevent to type any text in the textbox. Now we can call the function on the keypress event of textbox.